Sean Hannity got his first (unpaid) talk radio show in 1987 at KCSB-FM, the volunteer college station at UC Santa Barbara. He lasted 10 months before he got his first paying gig at WVNN in Hunstville, Alabama ($19,000 a year). From there he landed at WGST in Atlanta, then WABC in the Big Apple. 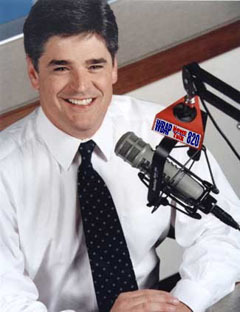 The Sean Hannity Show is now heard on 350+ stations, reaching virtually every city, large or small, in America. Twelve million people listen daily, as Hannity explains the evils of the liberal media and the virtues of conservatism. He has also been a frequent guest host on Rush Limbaugh's radio show. From 1996-2009, Hannity was 2/3 of Hannity & Colmes, a sort-of debate show on Fox News with Hannity offering his outspoken, opinionated voice from the right, and Alan Colmes occasionally piping in with a gentle rejoinder from the center (which on Fox is "the left"). Colmes left the program in early 2009, and Hannity's solo TV show Hannity has aired weeknights ever since. Statement by Bill O'Reilly, The O'Reilly Factor on Fox News, 25 August 2009, stating outright: "Sean Hannity is a Republican." O'Reilly was enumerating the politics of the cable station's hosts. Some have claimed that Hannity has recently switched his affiliation to Independent, but we have seen no transcript or reliable published report to confirm such a move.